What is HAP all about? Vision: A city in love with its river. Mission: Transform Portland’s relationship with the Willamette River. 1. 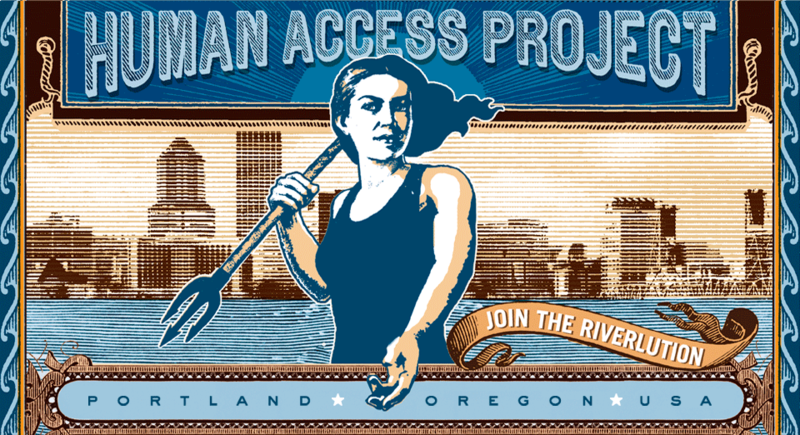 Create a human habitat and more accessibility points to the Willamette River. 2. Inspire people to get into the Willamette River. 3. Facilitate stewardship of the Willamette River and Watershed. Carrying our flag (in this case a trident) is Neptune, god of the seas and rivers. We have recreated Neptune as a modern-day female, defending the river and leading people to it. As an Olympian god, Neptune is endowed with fantastic powers. She is amphibious and able to survive in water and air. She can also communicate with all sea creatures and swim at superhuman speeds. Neptune wields an enchanted trident, possessed of mystical properties. During Roman times, a festival of Neptune, called Neptunalia, was held annually in the height of summer on July 23rd. It was one of the dies comitiales, when committees of public citizens could vote on civil or criminal matters. Neptunalia was a time of free and unrestrained merrymaking, during which men and women mixed without the usual Roman social constraints. Sounds like The Big Float.